Preactor® is the World's leading Advanced Planning and Production Scheduling Software. sl-ect limited is a Preactor “Solution Provider” and able to sell, license and support Preactor. We have developed a fast, flexible interface between Preactor and Sage 1000. Improvement in productivity - get more from what you already have - eg. reducing the number of set-ups required. Reduction in raw materials inventory - synchronize the purchasing MRP with an achievable schedule. Reduction in make-span time - reduce WIP that slows down production flow. Improvement in customer service - increase on-time deliveries with better promises and early warning of potential lateness. Planning agility - react quickly to changes in materials supply, customer demand or the availability of resources. Preactor creates an integrated plan of all resources - machines, people and materials. Jobs are forward or backward scheduled within the available capacity, then the system can highlight late orders and any material shortages (with a date required). Reports show capacity utilisation, work-to-lists, predicted sales order delivery performance and more. Material Explorer allows you to visualise the link between opening stock and producing and consuming orders, taking into account multi-level bills of material. 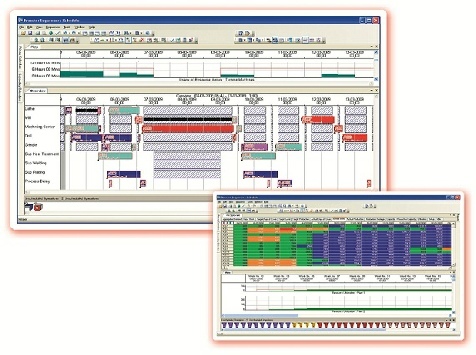 ”Blake UK now has complete visibility of not just its daily production plan but also its next 7 days projected workload. It also has the ability to manually adjust this plan and immediately see the impact of any changes made which can be invaluable when optimising delivery levels. Managing Director Paul Blake is adamant that as a result the company is in better shape than before. "Preactor has allowed to us to sizeably reduce our stock levels and improve our Just in Time capabilities which is why our lead time has been reduced from a number of weeks to just 7 days." Cavin Carver, the company’s Works Director, comments: "We use Preactor both for make to order and to allow us to carry stock on critical lines. As a result our production planning has been reduced from two days a week to half an hour a day. We have also improved next day delivery ability to approx 85% and have also reduced backorders. Before we installed Preactor we were backordering certain items seven or eight times when we were busy. Now it is very unusual to see anything backordered more than twice and when this happens, it is due to a stock error, failed manufacturing plan or failed delivery. We now have full visibility of the manufacturing plan for a week ahead on a rolling basis. This makes it much easier to adapt to changing requirements and assess knock on effects of changing the plan"
The final word belongs to Paul. "There’s more that we can do with the system but one thing’s for sure, we simply couldn’t have grown in the way we have as a company without Preactor." " sl-ect has helped us to develop our planning and stock systems. 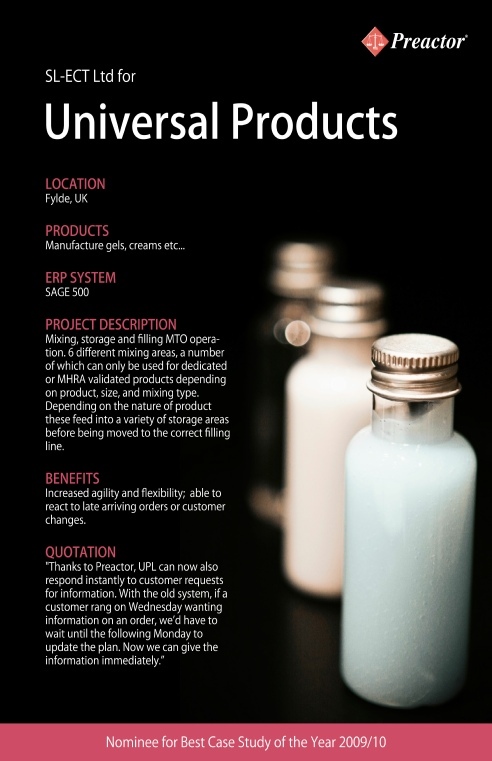 They implemented and support our Preactor system and its interface with Sage Line 500. What would happen if someone took away Preactor? For a start we would have to go back to holding high buffer stocks because purchasing would not have an accurate plan to work to. Preactor ensures that we have a valid sequence of running the related works orders, and outputs "Work-To" lists for each resource. This is just one part of the advantages of having full visibility of the plan. Previously we just had a list of jobs, now we have a colour coded Gantt chart view that is so easy to use when reacting to changes in the production environment. In other situations we can look ahead and spot potential problems, so we can actually be proactive instead of reactive. 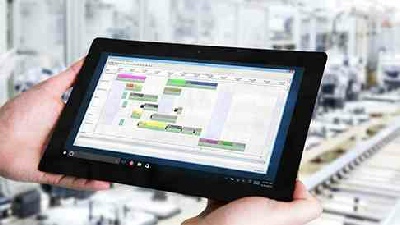 Shop-floor has visibility of the plan and they trust it because they know from experience that it works. Our Production Director knows that he can make decisions based on the capacity graphs because nothing is planned in the past, so the peaks and troughs in loading really are likely to happen in the weeks shown! This is vital because we frequently use temporary production and warehouse staff. And visibility for UPL means we can give visibility to our customers at the push of a button. We send a production schedule directly to some customers, for 2 reasons. Obviously they want to see when the finished goods will be supplied, but many also provide us with their own packaging materials and so they use the start date of jobs as a schedule for delivering the packaging to us. Our Maintenance department also use the planning reports - for instance they look for periods where they will be less involved with machine setups, and instead plan maintenance work into those time slots. And we have been able to achieve all of this without the Routings and WIP modules, which were too complicated for what we needed." So the entire supply chain is modelled in one system, allowing you to run and save various “What-If” scenarios. The riteTime data capture system has been integrated with Preactor to close the loop by feeding back actual production into the plan. Preactor can also be used to generate a Master Production Schedule (MPS), suggesting the production quantities for top level SKUs in order to keep future stock at an acceptable level. Providing days cover in make to stock and FMCG environments. The regular scheduling engine underpins this, providing rough cut capacity management and (optionally) a firm plan period based on an underlying Preactor 300FCS or 400APS system.